Example: what is the temperature of the Sun? This Stefan Boltzmann law calculator describes the power radiated from a body at a high temperature. With its help, you can calculate, for example, how much thermal energy is emitted from an asphalt road in the middle of the summer, or what the temperature of the Sun is. If you want to learn what is the thermal radiation formula, simply keep on reading! The Stefan Boltzmann law states that the power radiated from a black body (an ideal emitter) is proportional to its temperature, raised to the fourth power. For every other type of substance, the power is proportional to both T⁴ and the emissivity of the body. P is the power of body's thermal radiation. σ is the Stefan Boltzmann constant, equal to 5.670367 * 10⁻⁸. This constant is also used in our ideal gas law calculator. ε is the emissivity of the substance, expressed as the ratio of the thermal radiation from a surface to the radiation from a black body at the same temperature. The values of emissivity range from 0 (full reflection) to 1 (black body). A is the surface area of the body. Then, find out what is the emissivity of the Sun. You can assume that it is a perfect black body with emissivity equal to 1. The temperature of the Sun is equal to 5776 K. Don't believe it? Check it with the Stefan Boltzmann law calculator! 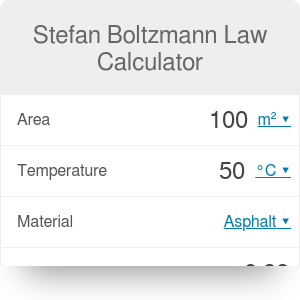 Stefan Boltzmann Law Calculator can be embedded on your website to enrich the content you wrote and make it easier for your visitors to understand your message.